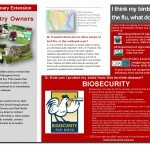 Here is a printable trifold with Bird Flu questions and answers for clients. -this article appeared in JAVMA(Journal of the American Veterinary Medical Association)Vol 247, No. 12, December 15, 2015 FARAD Digest. (Food Animal Residue and Avoidance Program) All credit to the authors. Numerous challenges are associated with the treatment of backyard poultry flocks. There are a limited number of drugs approved for use in laying hens in the United States, and the few drugs that are approved were designed for administration to birds in large commercial operations, which makes their administration to individual birds or a small number of birds tedious. Consequently, veterinarians often end up administering drugs to backyard poultry in an extralabel manner. Unfortunately, the extralabel use of most of those medications is hindered by the availability of only a limited number of pharmacokinetic studies on drug residues in eggs. This is compounded by the fact that owners of backyard poultry flocks are likely to consider their birds pets and are agreeable to or demand more complex treatment regimens than those traditionally used in commercial flocks. The purpose of the digest reported here is to provide veterinarians with summary background information on appropriate drug use in modern backyard poultry flocks. WASHINGTON, January 15, 2016 — The United States Department of Agriculture’s (USDA) Animal and Plant Health Inspection Service (APHIS) has confirmed the presence of highly pathogenic H7N8 avian influenza (HPAI) in a commercial turkey flock in Dubois County, Indiana. This is a different strain of HPAI than the strains that caused the 2015 outbreak. There are no known cases of H7N8 infections in humans. As a reminder, the proper handling and cooking of poultry and eggs to an internal temperature of 165 ˚F kills bacteria and viruses, including HPAI.